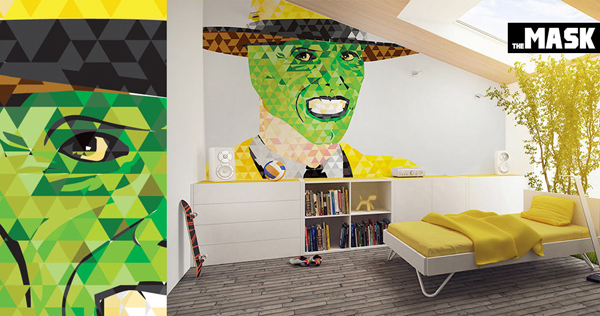 Pixers design studio created a range of wall murals that depict the classic and modern movie characters/posters in mosaic style. 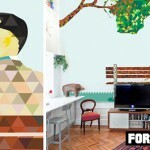 The picture is compiled with differently colored triangles while the background can be solid or patterned. The murals include such classics as Amelie and Star Wars as well as the modern films like Skyfall and Django Unchained. 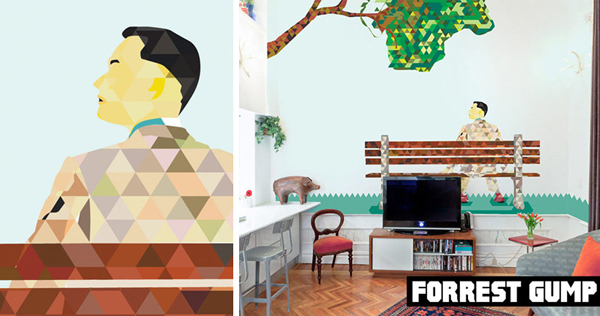 The style of these fun and playful murals can fit into both traditional and modern interiors. They are great for creating feature walls and sprucing up the walls in any of the rooms. The best thing about these murals is that they don’t feel like regular movie posters that would make your room look like a local cinema. There is also a Mask wall mural, as well as murals of Joker and Forest Gump. Amélie mural depicts a green Eiffel Tower and Amélie holding a spoon while Forest Gump is depicted sitting on a bench under the tree. 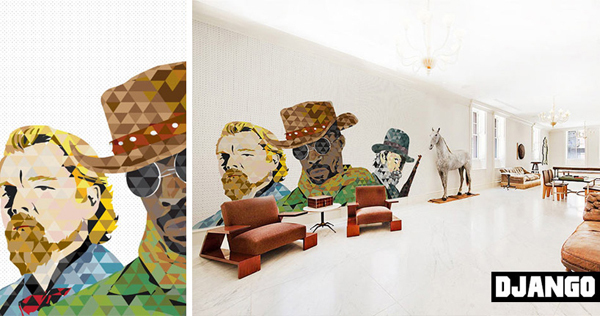 Django Unchained mural shows three main characters – Django (Jamie Foxx), Dr. King Schultz (Christoph Waltz) and Calvin Candie (Leonardo DiCaprio). 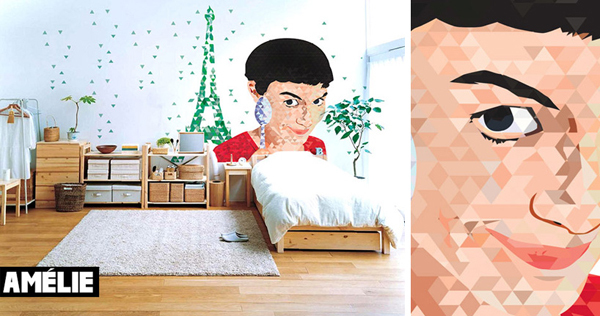 Pixers specializes in creating interesting wall decorations made of vinyl that include murals, stickers and posters/prints. Their designs are divided by themes, destinations and collections. Pixers offers a wide range of designs and themes from which you can choose the ones that will suit your bathroom, kitchen, bedroom, living room or other parts of the house you want to jazz up. 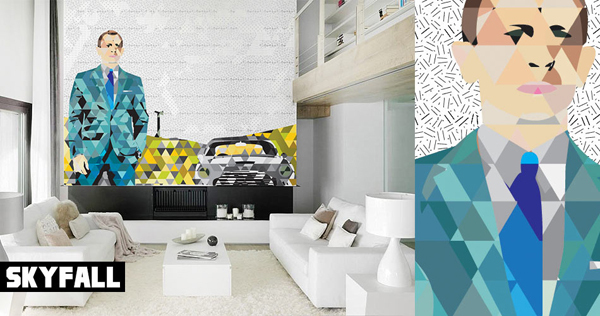 The ‘Cinematographics’ wall murals come in vinyl, premium vinyl, easy-to-install self-adhesive material called PIXERstick, and self-adhesive. Tear-resistant PVC foil (vinyl) doesn’t let glue stain the picture, while the vinyl premium is breathable and more durable. 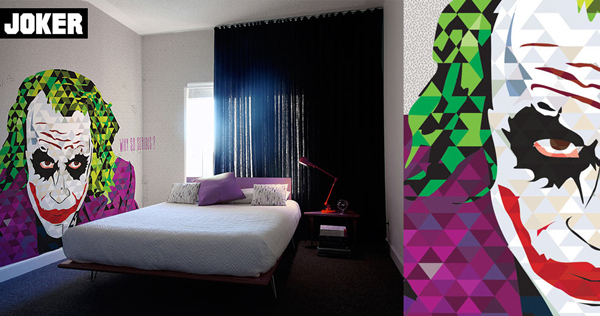 You can also order wall murals with various effects. 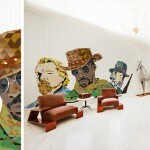 So what do you think about the movie-inspired wall murals in mosaic style?